THE Taoiseach has written a letter to pupils of a north Belfast Gaelscoil to thank them for sending him a handmade St Brigid’s cross. 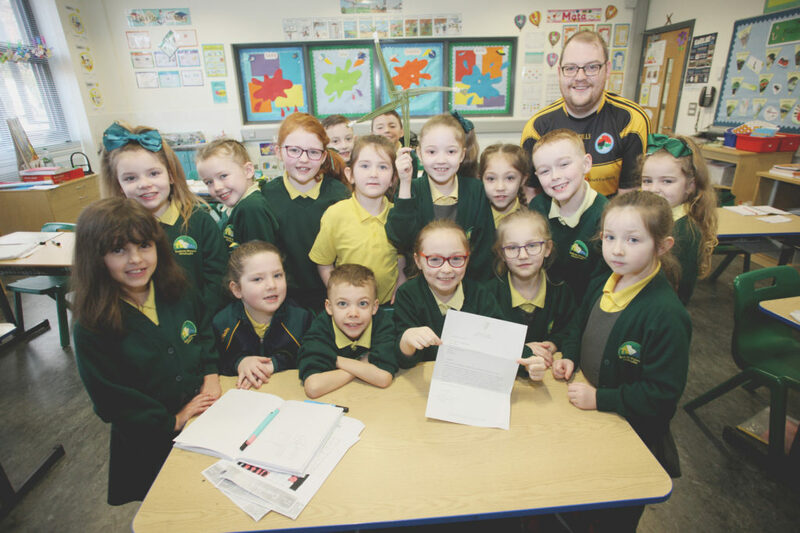 Primary four (Rang Ceathair) pupils at Bunscoil Bheann Mhadagáin sent the cross along with a heartfelt letter to Leo Varadkar in the hope that it would offer him protection, support and strength in the coming year. Excitement was building after Sinn Féin Senator Niall Ó Donnghaile hand delivered the gift to the Taoiseach’s office and tweeted to confirm its arrival. The kids’ hard work was rewarded when the Taoiseach replied with his thanks. Rang Ceathair teacher, Diarmuid Ó Tuama, said that his class were delighted by the Taoiseach’s response. “It took me an hour to settle them all down,” he said. “I went up on the Black Mountain with Niall getting the reeds – it took us hours to collect them because I didn’t know how many I would need to collect. She also has some ideas to save her teacher from getting the cold next year. “My next door neighbour has some of those reeds in his garden. We can get them there next year,” she said.